Fascia and eves! Although these terms are lesser known among homeowners, they are important architectural elements of your home! Eaves are extensions of your roof that overhang your home’s exterior to provide shade and direct water clear of your walls. Fascia are the finished surfaces that connect eaves to walls and gutters. Because these architectural elements are designed to protect your house from the elements, they are facing constant wear and tear from both the sun and rain. They also serve as accents for your home’s exterior, and can be an extremely noticeable eye sore if they are weathered, chipping, or rotting. AllPro’s professional painting contractors are the best choice for painting your fascia and eaves. Do you have cracking of chipping in the paint on your home’s fascia or eaves? Let us take care of it with a quality new paint job! 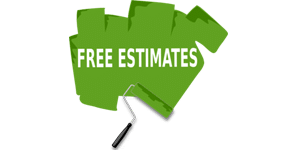 Because these areas of your home are only accessible from the roof or a ladder, these painting projects can be difficult and dangerous, and are better left to professional painting services. AllPro contractors are trained to paint hard to reach fascia and eaves with precision and quality…and always with professionalism, excellent customer service, and 100% customer satisfaction. Fascia and eaves that are made out of wood are in a constant cycle of being water logged and then dried by the sun. This process is extremely straining on wood, especially if it is not protected by the right paint job. Rotted fascia and eaves can lead to big problems and further damage to your home; including mold and wall rot. AllPro offers residential carpentry and wood rot repair, and can easily diagnose and repair damaged fascia and eaves! Call us!